Everyone knows the story of Marco Polo, the Venetian who went to China, befriended the great Khan, and brought back marvelous tales of the exotic Cathay. Polo himself dictated the story from a prison cell in Genoa, and some of it took on flights of imagination. But the Italians have a saying that it doesn’t much matter if a story isn’t true, so long as it’s a good story. But there is another dimension of the story. Venice was Europe’s gateway to the Orient in the 13th and 14th Centuries. The Venetians had the galleons, the venture capital, and the connections in the Levant that led to the fabled Silk Road. At the other end were not only the silks, but spices and other wondrous things. And, of course, markets in which to trade the offerings of the West. Europe was still in the “dark ages” and China was out ahead on a number of fronts. Venice had pretty much of a monopoly on the China trade until Vasco Da Gama pushed his way around the Cape of Good Hope and all the way to Goa in 1497 and fate of Venice, which was already well past its economic prime as the gateway to the Orient, was sealed. First the Portuguese, then the Dutch and English would come arrive in the Orient by sea and the new gateway to China would pass to Macau and, eventually, to Hong Kong. There interesting similarities and differences between these two gateways to China, Venice and Hong Kong. They are both cities of traders, intermediaries between the West and the East, who grew rich on taking their cut as part of the process. Neither would have made it as city that relied on local productive capacity. Venice produced glass and a few other products; Hong Kong assembles electronics and watches and toys. But location , not raw materials or production resources, has been the key to their economic success. The palazzos of rich Venetian merchants were also their warehouses, and the trading houses of Hong Kong lined their waterfronts first with godowns and today with container terminals. Trading on the increased value of commodities is their game. But there are differences as well. Venice is a place that was literally built on the sea. To secure themselves from the invasions of “barbarians” from the north after the fall of Rome, the Venetians drove millions of larch piles into the mudflats in an Adriatic lagoon, upon which they constructed a city of unique urbanism and architecture that is only a meter off the sea. Hong Kong is essentially a large vertiginous rock and resembles Venice only in that it, too, acquires land for building, by filling in its harbor. 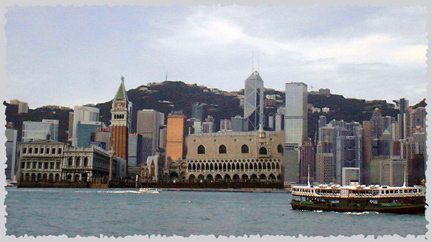 Both cities started out as little fishing villages, but Venice grew to a city of a unique, vernacular, architecture,  while Hong Kong first adapted colonial British designs, and these days copycats international styles. Hong King is vertical; Venice, low and flat in profile save for its campanile . A striking contrast is that Venice was an independent city, called and admired by the British as the “thousand year republic.” Until its re-absorption into China in 1997 Hong Kong was a British colony, ruled by a nation half a world away primarily for its benefit, and will henceforth be ruled from Beijing. Venice, after a brief period of Austrian rule regained its hegemony as a democratic city in the Italian nation; there seems little likelihood that Hong Kong will become a true democratic city unless China itself becomes democratic. Hong Kong is allowed, until 2056, to operate under the ambiguous “one country, two systems” doctrine, but it appears that the system to the north, and not Hong Kong will be the most dynamic system. It is already evident that bit is China that has the factors of production that have thrust onto the A list of the world’s economies. That, and the acceptance of China into the WTO sealed the fate of Hong Kong as compradore . Neither Venice, nor Hong Kong had much in the way of economic diversity to fall back on as their roles have shifted as a result of changes in transportation, politics and the emergence of globalism. Venice at least invested greatly in its art and architecture, which today permits it to function essentially as a “museum city,” a unique place that must be visited to be truly appreciated. It produces glass products and Carnivale masks for tourists, hosts artistic events, but for much of the year is nearly a ghost town. Hong Kong has no such artistic legacy to fall back on. As a colonial city it was to be exploited, and its rulers regarded it as a temporary “home.” Hence, infrastructural investments needed to be justified on their rate of monetary return. Even its universities appear very much as appendages to corporate structure. Now the British are gone, and a Beijing-approved satrap called the “Chief Executive” is installed in the place of the colonial governor. Before they departed the British hypocritically called for democratic rule, something they had denied the people Hong Kong for a century and a half. The Chief Executive is “voted in” by a small and select group of people, not too dissimilar as the manner in which doges were placed in power in the heyday of Venice. Recently, Jan Morris, who has written excellent books on both Venice and Hong Kong, was asked in an interview at the Hong Kong Literary Festival, which was her favorite city. Without hesitation, she said “Venice.” Hong Kong she saw as a mercantilist city, and with only fading resemblance to the city that she wrote about in 1974. Hong Kong has always created wealth out of its real estate. The majority of its richest men have made their fortunes in real estate. These days it acquires land for development by filling in its harbor and by taking over older Chinese neighborhoods and clearing them for high-priced re-development. In the process, Hong Kong is selling off the very features that make it an interesting city to visit—a blend of East and West—for the profit of the few. Most recently the venerable Starr Ferry terminus in Central was demolished to make way for a roadway, and the marvelous wet markets in the oldest section of the city are scheduled for demolition to make space for high-priced high rises of residential flats. Not that the local powerbrokers and money-makers have totally neglected the common people of Hong Kong—they recently opened a Disneyland on Lantau island, and a new Wal Mart super store in the New Territories. Venice’s lacy Gothic style is very much a product of the necessity for buildings to be both substantial, yet as light in weight as possible because of the subsurface on which they are constructed. The World of Venice (Harcourt). James Morris became Jan Morris at around that time, chronicling his-to-her transgender surgeries in Conundrum (1974). Hong Kong was first published in 1985.